FunBox Blog: How Come There Aren't Any More Shakespeare Plays? How Come There Aren't Any More Shakespeare Plays? Seriously, how come? I mean everyone seems to like them (or at least pretend to). It seems like the high school puts on another production of Macbeth every few years so there's clearly a market. Here, I'll even do the hard part and sketch out an outline for you. The play opens in Rome. 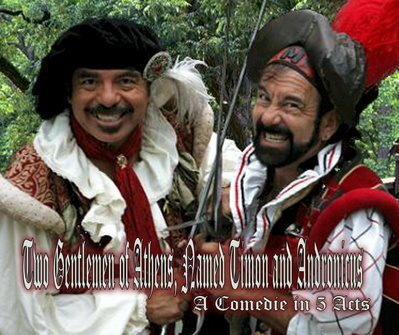 There are riots in the streets, Timon tries to convince his cousin Andronicus, who has just learned by letter that his son has died, to come with him to Athens. Andronicus at first refuses, but later relents and decides to leave Rome. Andronicus delivers his famous “I have just learned, by letter, that my son is dead” speech. As the two head out of Rome, Timon meets his old friend, The Fool Cardino, Cardino is grieved to learn, by letter, that his daughter, Cardina, has died. Cardino and Timon plot to kill Andronicus. Andronicus writes a letter to his brother Cinna back in Rome and gives it to Cardino to deliver. Cardino replaces it with one of his own, informing Cinna that Andronicus is dead, and delivers the letter to Cinna. Horrified by this news, Cinna declares war on Athens. Meanwhile, Andronicus has a dream wherein he learns of Cardino's plot to kill him. Andronicus tries to convince Timon to return with him to Athens. Andronicus tells Timon that he has received a letter informing him that his daughter, Brysius is planning to wed, and that he has forgotten his hat. Timon delivers his famous “I don't see what the big deal is, it's just a hat” speech. While on the road back to find the two gentlemen Cardino is ambushed by robbers. He delivers his famous “I've been stabbed multiple times, but I'm still making jokes about it” speech, and dies. The robbers compose a letter informing Andronicus that Cardino is dead. Cardino's daughter, Cardina (not dead after all), and Brysius each compose letters to their respective lovers, but the servant Borilus' mis-delivers them and they fall in love with each other instead. Cardina decides to pretend to be a man to spare Brysius's feelings, and delivers her “How hard it is to feign to be a man when you are, in fact, a woman” speech. Andronicus, thinking that Timon is actually Cardino, stabs and kills him. He is filled with remorse. We learn that Brysius was actually a man pretending to be a woman, and mad. The play ends with the happy wedding of Brysius and Cardina at Timon's funeral. As you can see this play, with it's themes of love, betrayal, political upheaval, madness, violence, family and letters is still relevant today. Now all thou has't to do is write the Dialog!